FAKTR-PM (Pronounced FACTOR-PM) was created by Dr.’s Hyde, Doerr and Deboeno as a way to address stubborn soft tissue injuries and return athletes to their activities quickly. FAKTR-PM stands for Functional and Kinetic Treatment using Rehabilitation, Provocation, and Movement. 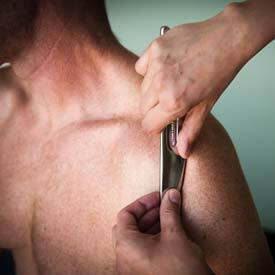 It combines instrument-assisted soft tissue techniques (e.g. Graston technique) with rehabilitation exercise movements. It is felt that this stimulates the cells of the body to heal faster while, at the same time, correcting the nervous system’s movement control of the injured area. Clinicians have found that combining manual treatment of soft tissue with proprioceptive exercises produces faster results than conventional treatment methods. What conditions can FAKTR-PM treat? FAKTR-PM can treat a wide variety of musculoskeletal conditions including tendinopathy, sprains, strains, and entrapment syndromes, fascial restrictions such as plantar fasciitis, ITB syndrome, myofascial pain syndromes, adhesive capsulitis, shin splints and post-surgical recovery. This list of conditions that can be treated are too numerous to list here! Who is the ideal patient for FAKTR-PM? While this is a great way to treat athletes quickly, the concept can be applied to all ages and all body types. FAKTR-PM is excellent for those involved in auto accidents; work related injuries, sports injuries, post-surgical work including joint replacement and conditions of daily living. book your Calgary FAKTR consultation appointment today!